The House and Senate convened at noon Saturday, but no votes were scheduled and many lawmakers have already left town. 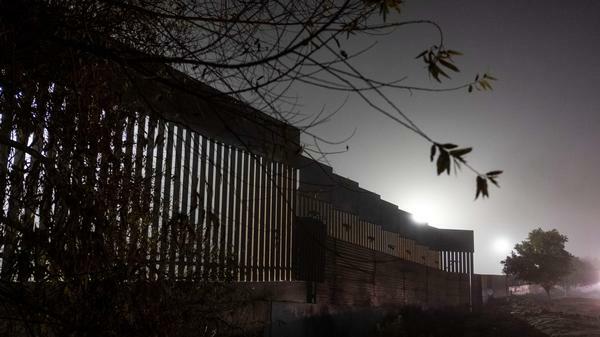 A reinforced section of the U.S.-Mexico border fence is seen from Tijuana, Mexico. President Trump seems to be flexible on the materials that would be used, as he has reportedly talked about steel slats and even tweeted a cartoonlike rendering of such an idea. The partial shutdown of the federal government that began just after midnight Saturday won't be ending anytime soon. The Senate has adjourned with no business in the chamber anticipated before Thursday afternoon and, maybe not even then, if congressional leaders and President Trump can't reach an agreement over the president's demand for $5 billion in funding for his border wall. The House and Senate convened at noon Saturday, but no votes were scheduled and many lawmakers have already left town. House GOP leaders have advised lawmakers that they will be given 24 hours' notice of any planned vote. In remarks on the Senate floor, Majority Leader Mitch McConnell put the burden on Trump to cut a deal with House and Senate Democratic leaders, Nancy Pelosi and Chuck Schumer. "When those negotiations produce a solution that is acceptable to all of those parties, it will receive a vote here on the Senate floor," McConnell said. Trump announced on Twitter that he would be holding a lunch meeting in the White House residence with a "large group" to discuss border security. That group included conservative members of Congress, no Democrats. Separately, Schumer met with Vice President Pence. Not long after the lunch ended, McConnell announced the Senate was going home. "Senators will be notified when a vote is scheduled. In the meantime, negotiations will continue," he said. It is the third time this year that the federal government has been shuttered, even if only briefly. 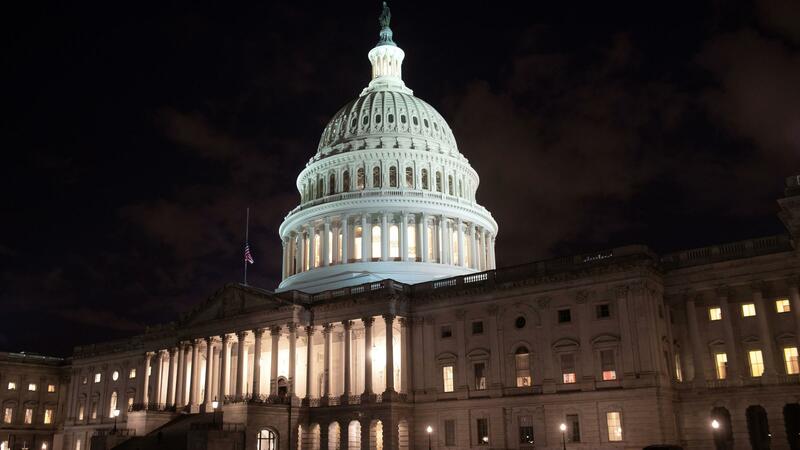 A government shutdown is typically an unlikely occurrence and had been virtually unheard of under unified party control, underscoring the dysfunction that has become normal in Washington even with a GOP-controlled Congress and White House through year's end. But with Democrats set to control the House of Representatives come January, Trump saw the chance of receiving the funding he desired for his signature campaign issue about to vanish. Under pressure from his base and conservative commentators, he insisted that more than $5 billion in funding for his border wall be included in any spending measure passed to keep all of the government operating. He seemed to be flexible on the materials that would be used for the wall, as he has reportedly talked about steel slats and even tweeted a cartoon-like rendering of such an idea, but billions in spending to build some type of barrier along the southwestern border remains a requirement. That remained the Trump administration position on Saturday afternoon, with the demand being $5 billion in funding for a physical barrier. But an administration official, who declined to go on the record while briefing reporters, said this was an area of negotiation and that it doesn't have to be made of concrete. "[President Trump] is talking about a 20- to 30-foot steel slat barrier," the official said. "That's important. That said, we are also trying to get other border security priorities accomplished as well and so it is part of the negotiations that are taking place." On Wednesday, the Senate passed a bill that would have funded the government through early February and it looked as if a shutdown would be avoided. But that deal fell apart on Thursday, when Trump indicated he wouldn't sign that bill after all. The House then passed legislation that included the money Trump wants for the border wall, but the House bill doesn't have the votes to pass in the Senate. McConnell said Friday night that the Senate wouldn't take any more futile votes until a deal all sides could support was reached. Vice President Pence, who had to break a tie on a procedural vote in the Senate on Friday evening, budget chief and incoming White House acting chief of staff Mick Mulvaney and White House senior adviser Jared Kushner met with both Republican and Democratic party leaders throughout the day and into the evening. Three-quarters of the government is not affected, because budget bills funding those operations had already been approved. But the remaining 25 percent subject to the shutdown includes Homeland Security, Justice, Commerce, Interior, Agriculture, Housing and Urban Development, and Transportation departments. Even among those affected, some personnel are deemed essential and will be expected to report to work without pay, for now. That includes FBI officers, Border Patrol agents and Transportation Security Administration agents — during one of the busiest travel periods of the year. In the past, however, Congress has approved back pay for furloughed federal workers. The political finger-pointing over who was to blame started well ahead of final negotiations. Trump tweeted Friday morning that "The Democrats now own the shutdown!" However, in an Oval Office meeting last week with House Minority Leader Pelosi, the likely next speaker of the House, and Senate Minority Leader Schumer, Trump said he would be "proud" to shut down the government over the wall. "I'll be the one to shut it down. I will take the mantle. And I will shut it down for border security," Trump said then. Trump had been slated to depart Friday for a 16-day holiday vacation at his Mar-a-Lago resort in Florida but postponed the trip once it was clear the government would shut down. On Friday night, Trump posted a video to Twitter seeming to take yet another position about responsibility for the shutdown vis-à-vis Democrats. "We're going to have a shutdown. There's nothing we can do about that because we need the Democrats to give us their votes. Call it a Democrat shutdown, call it whatever you want, but we need their help to get this approved," the president said. "So Democrats, we have a wonderful list of things we need to keep our country safe. Let's get out, let's work together, let's be bipartisan and let's get it done. The shutdown will hopefully not last long." Democrats, however, framed the situation far differently. On Thursday, Schumer said Trump's "temper tantrum will shut down the government, but it will not get him his wall." And Thursday night, Pelosi said on Twitter that "Democrats are for real border security solutions. Not for wasting billions of taxpayer dollars on an immoral, ineffective & expensive wall."